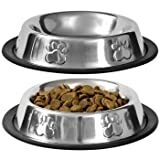 These metal sturdy pet bowls are ready for chow time! Bowls are the perfect size for kittens, cats, and small dogs, and the non-slip bottom helps keep them in place. Great gifts for home, kennels, and shelters, and a wonderful resale item for pet stores, grocery stores, and veterinary offices.